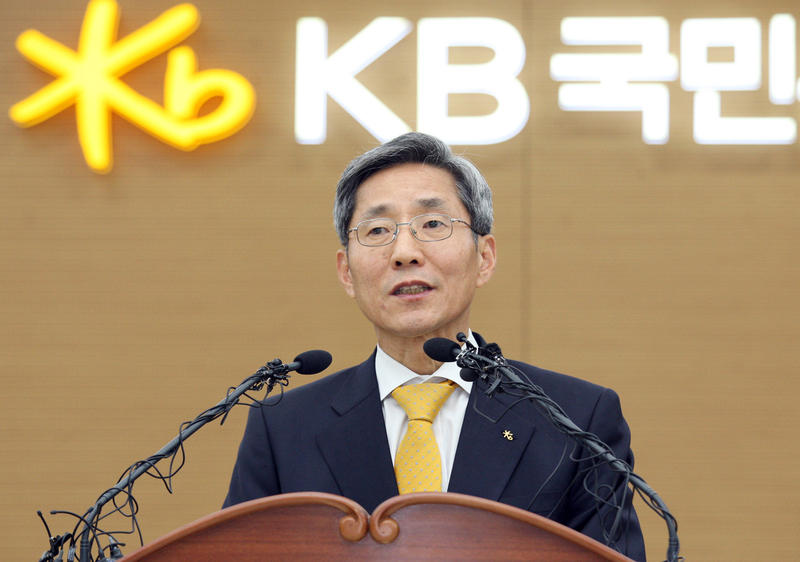 KB Financial Group posted 953.8 billion won in net profit in the 3rd quarter, up 6.3 percent YoY with the figures close to 1 trillion won, keeping its position as a leading financial group in Korea by beating it s closest rival Shinhan Financial Group with 847.8 billion won in net profit for the same period. KB Financial’s net profilt in the first three quarters of this year came to 2.868,8 trillion won up 4 percent YoY, and still ahead of Shinhan Financial Group with 2.643.4 trillion won in net profit in the same period. The group’s actual Q3 net profit increased 13.3 percent if the onetime profit figures from the sale of the stakes in BBC in Kazakhstan and the savings from taxes paid on the KB Non-Life Insurance Co.’s inexpensive purchases were excluded. Based on the net profits in the first three quarters, the financial group would not have trouble posting 3 trillion won in net profit for this year like it did last year, the financial sources estimated. The group’s net profit in 2017 amounted to 3.311,9 trillion won, which was attributed to robust interest earnings and non-banking affiliates doing very well in their operations last year. The interest earnings in the Q3 amounted to 6.591,5 trillion won up 8.4 percent YoY with NIM standing at 1.72 percent in the quarter, up 0.01 percent, up 1 bp from the preceding quarter. Q3, up 14.8 percent YoY. The recovery of the loan loss provision in the quarter amounted to427.8 billion won, down 10.9 percent YoY, due mainly to preemptive efforts to cut the losses. The group’s total assets as of the end of Q3 stood at 477.700 trillion won, up 9.4 percent YoY. The own capital ratio based on the BIS standard came to 14.93 percent down from 15.12 percent in the previous quarter. By its affiliates, KB Bank posted 2.739 trillion won for its Q3 net profit, up 12.9 percent YoY. Its loans amounted to 252.100 trillion won , up 7.3 percent YoY with the household loans and corporate loan leading the way up 2.9 percent and 3.6 percent YoY. KB Card and KB Non-Life Insurance followed the bank in net profit figures with 245.5 billion won and 260.9 billion won respectively. KB Securities logged 211.2 billion won in net profit in the quarter , up a whopping 31.9 percent YoY. Officials of the group said the group’s affiliates did well despite the unfavorable conditions including the restrictive measures on household loans, and the fear for dull economic conditions and the expansion in the changeable factors in overseas financial market due to sound growth in loans and the stable management of expenses, among others. KB Financial Group, Inc. is a holding company that engages in providing financial services through its subsidiaries. It operates through the following segments: Corporate Banking, Retail Banking, Other Banking Services, Credit Card, Life Insurance, Investment and Securities business. The Corporate Banking business segment provides services such as loans, overdrafts, deposits, credit facilities and other foreign currency activities. The Retail Banking business segment offers services such as private customer current accounts, savings, deposits, consumer loans and mortgage loans. The Other Banking business segment provides services relating to banking business besides corporate banking and retail banking services. The Credit Card business segment offers services such as domestic as well as overseas credit and debit card operations. The Investment and Securities business segment provides services such as investment banking and brokerage. The Life Insurance business segment provides products such as life insurance and wealth management. The company was founded on September 29, 2008 and is headquartered in Seoul, South Korea.